Our lorries do vary in size slightly but to give you a better idea of what vehicles would be best to transport your goods, you can refer to the following information to know better about the different size of lorries. The smallest of the lorry fleet, the 10 ft lorry is the most suitable for the basic transportation of goods and simple house moves. It is frequently used for the transportation of single items like queen size mattresses, refrigerators, washing machines and other small household appliances. 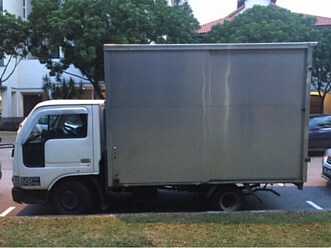 Not only is the size of the vehicle important, do also take note of the weight of the items. If the items are too heavy, they cannot be loaded onto the vehicle as this may damage the suspension of the lorries. Certain loading areas have a height limit and so the larger vehicles may not be able to fit into the area. Do take note of the height clearance for your pick up and drop off point so that we can plan for the appropriate lorry to pick up your items.